If you want to find Joy, do what you love. I published my first remix of Bud Caddell’s ‘How To Be Happy In Business‘ 2 years ago, but some recent conversations have inspired a few fresh tweaks. I’ve tried to distill it into a very simple tool for reviewing your current career situation and ensuring you’re on the right path to a happy and fulfilled life – hence why I call it ‘Career Planning in 60 Seconds’. If you’ve not found the way to your central ‘heart’ yet, now’s the time to start thinking about where you want to go in your career, and in your life. Critically, it’s up to you to choose your path; only you can define what ‘Joy’ means for you, so don’t wait for someone else to tell you what to do. Your passions, e.g. music, design, photography. Your beliefs, e.g. environmental sustainability, education for all, societal equality. Your ‘soul food’, e.g. spending time with your family, community activities, teaching students. Most people need money to live, so regardless of whether you like that fact, take some time to work out what your desired lifestyle costs, and then add on some extra for savings and special occasions. However, if you genuinely believe you can be self-sufficient and survive without money, and that lifestyle appeals to you, add it to your list. Try to think laterally about how you might achieve your lifestyle goals too, especially in light of the things you listed for the previous two circles; could a change of city, country or lifestyle help you to make things in the other two circles more viable? The trick is to find a job, career or vocation that links at least one thing on each of your three individual lists. 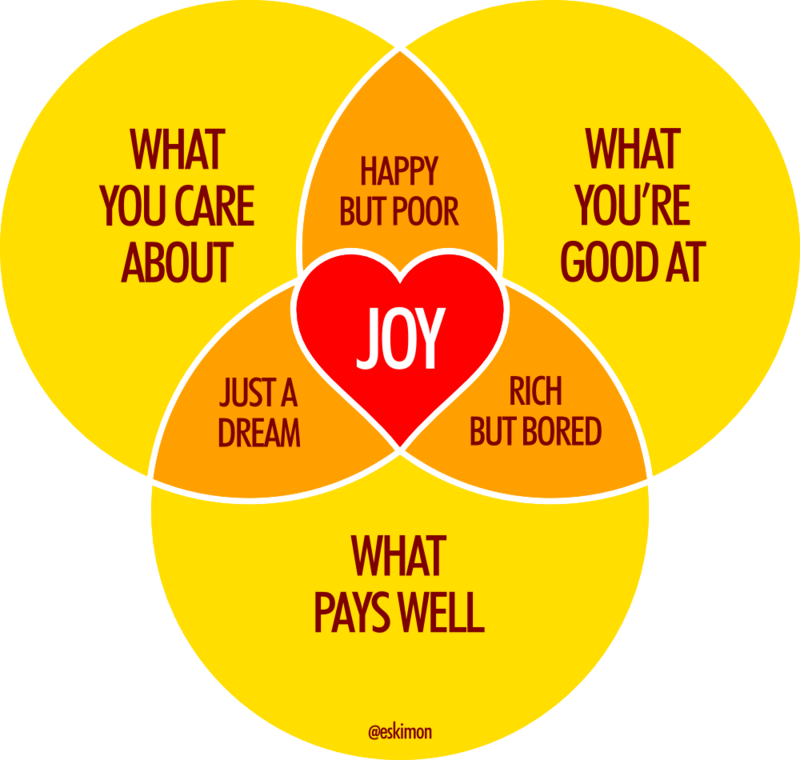 As the orange sections highlight, any form of compromise will leave you feeling incomplete, and it’s only when you can link all three yellow circles that will you find your true Joy. However, it’s unlikely that you’ll find your way to the central heart straight away, so use these orange sections to guide your path, based on how you’d like to live your life in the meantime. It’s also important to stress that the path to Joy will be different for everyone, and that the path is rarely clear or straightforward. However, unless you start proactively making things happen yourself, it’s very unlikely that you’ll reach your heart by accident. So start planning your path now, and give yourself the best possible chance of living a Joy-filled life. Sounds easy on paper but really hard to do in real life. BUT I love the challenge of trying to find that inner peace, contentment.